I’m not a big follower of the power metal scene, but damn if “The Lonesome Prince” isn’t one of the best power metal compositions to come out of Finland in years. Not familiar? You need to check out Everfrost, a very geeky and anime-influenced, yet non-over-the-top, stylish, and talented band. 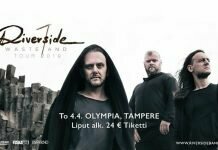 Their latest release, a live album entitled A Cold Night Out, was filmed at The Circus earlier this year, was the first time we got to hear the aforementioned hit with new vocalist, Mikael Salo. These guys are doing big things, and I’m really excited for their next album (coming out next year), so they’re very high on my radar right now. On the more well-known but new front, Auri is Tuomas Holopainen’s new side project with Johanna Kurkela and Troy Donockley. While it could be years and years before we get another album from them, I have to say that the first album was at least fun enough that I’d like to hear more celestial fantasy music in the future. The rest of the new bands that struck me this year are basically all of Mikael Salo‘s other bands. Dyecrest, Thy Row, Trio De Facto (and its brother band, Metal De Facto)… well, you’ve got this one guy who’s a wicked singer and a great frontman at the forefront of all these bands, so they’re all on the watch list as a result. I have to admit that I haven’t heard the debut album by Niclas Etelävuori (ex-Amorphis) and the ex-HIM men yet, but I found the preview singles promising, so I’m going to nominate these guys anyway, based on the strength of those songs. Most of my new musical discoveries this year come from the domains of indie and pop, which aren’t exactly Musicalypse’s forte, but I have to give a shoutout to Ruusut (who were also great live! ), Snail Mail, and Anna Burch, all of whom released nice debut albums this year, as well as Hatchie, who put out her first EP. Sounds from the Vortex by The Spirit is definitely the freshest black metal album I’ve heard this year. For such a new band, it’s very well balanced and mature. Nothing feels over the top, it’s consistently melodic and heavy while maintaining a solid atmosphere. These guys are on track to becoming the next Watain. Black Royal is traditional death metal in a modern production from Tampere, Finland. The sound is as dark as can be but the guitars are still nuanced and varied. Lightbringer opts to be slower and more deliberate rather than show off the fastest shreding. Tartarum is still a fairly grassroots act. They were formed in Cyprus last year. This year they came out with a solid debut: Tales of Ancient Times. Its nothing revolutionary but a robust melodic death metal album, for sure. A couple of days ago I saw The Spirit live for the first time. I didn’t know their music at all, before going to the gig. It turned out to be the biggest discovery for me. I’ve had their album Sounds from the Vortex on repeat ever since. 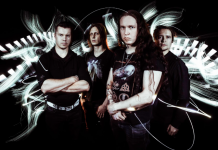 Tocornal is a heartbreak rock band from Kuopio who play fusion rock. They recently released a debut album and I had the chance to watch them play live, wherein they totally convinced the audience of their worth. The amount of energy this band has is incredible. Paara released Riitti in the beginning of 2018 and left a really huge impact on me – this black metal band is definitely on my radar right now. The atmosphere that they created in their release really struck me. Definitely a band to look out for. Previous articleDARK HELSINKI – Who is Miseria Ultima?